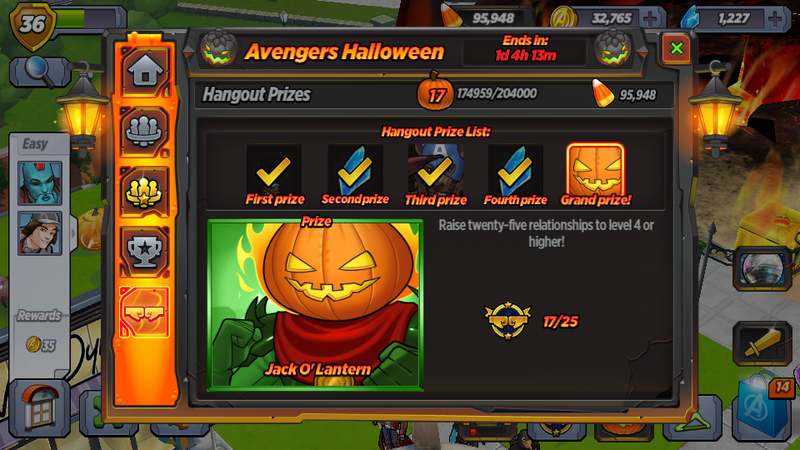 In order to unlock Jack O'Lantern you had to complete the Hangout Prize list. The Grand Prize was Jack O'Lantern. Thunder Loki: You're Pumpkinhead?! I need to have a serious discussion with my father about this institution's questionable admission standards. Jack O'Lantern: I'm just here to have fun, and cut pumpkins. I ain't never been to a school without tin foil or bars on the windows. Thunder Loki: And what do your people do for fun besides placing hollowed out fruit on their noggins? Jack O'Lantern: The Pumpkin Dance! Jack O'Lantern: Nice dancin'! My daddy does that same move when he's waitin' for the grill to get hot! Thunder Loki: Thank you for comparing my mastery to your dimwitted father's impatient wobbling. Jack O'Lantern: You're welcome! You want a pumpkin?! Thunder Loki: Do I look like a fruit farmer? Jack O'Lantern: More pumpkins for me! Jack O'Lantern: Hello, ma'am. Do you mind if I scare you? Misty Knight: Who are you? Why are you calling me ma'am? Why do you wanna scare me? And why are you asking for permission? I'm confused right now. Jack O'Lantern: Me too, but I just love scarin' folks! Misty Knight: Because of Halloween? Jack O'Lantern: Shoot, I already forgot about Halloween! What's wrong with you, Jack O'Lantern?! You crazy son of a gun! Jack O'Lantern: Man, I wish I was a scarecrow for real! Misty Knight: I don't think it's that hard. You just stand really still in a field. Anybody can do it. Jack O'Lantern: Wowee zowee! Keep reachin' for them stars, Jack! Jack O'Lantern: Well, you sure heard wrong! I used to murder like nobody's business, but that was before I discovered the power of pumpkin positivity. Pirate Wasp: Hey Jack O'Lantern! I'm Wasp! I heard you're super crazy, but super duper positive! You're like me with pumpkin breath! Pirate Wasp: Ooooh...total existential crisis. Jack O'Lantern: I don't know what that means. Pirate Wasp: Me neither! Let's punch stuff! Pirate Wasp: Do you feel better? Jack O'Lantern: I most certainly do. I did a lot of thinkin' whilst punching that bag. Back home, we don't have no fancy bags. When we need to punch and think, we just gotta punch the air, and make our own sound effects. Jack O'Lantern: Thank you kindly, Miss Wasp, you sure have made ol' Jack feel like the freshest sprout in the pumpkin patch. Pirate Wasp: Pumpkin fist bump! Jack O'Lantern: Look at me! I'm like the city folk! 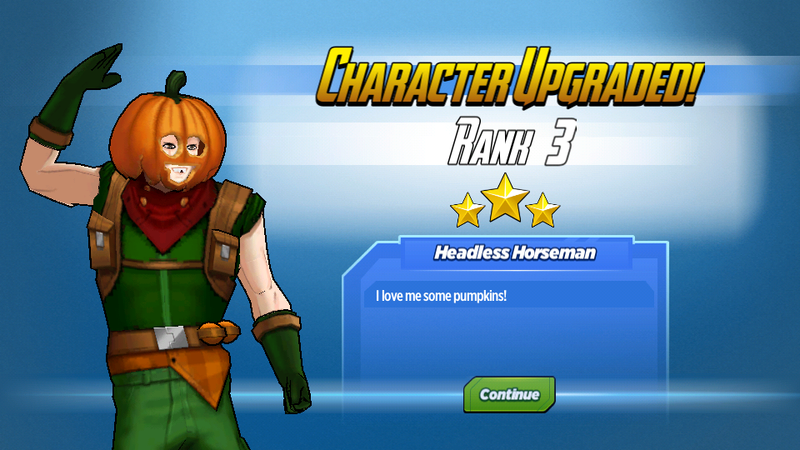 Hank Pym: Jack O'Lantern! 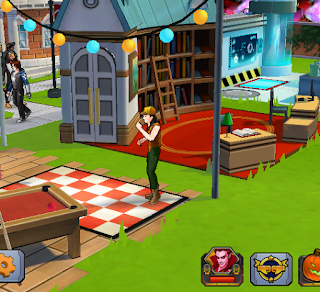 How are you enjoying the superhuman pumpkin patch that is Avengers Academy?! Jack O'Lantern: Who are you? Hank Pym: That's an infinitely complicated question, but for the sake of simplicity, I'm Professor Hank Pym! I teach all things super-science at the Academy! Hank Pym: Times are changing, and I have a scientific dilemma that requires the assistance of a pumpkin-headed hero! Hank Pym: That's what I always say! Jack O'Lantern: I don't understand why we're so excited right now! Jack O'Lantern: How can a pumpkin-lovin' man like me help a super-smart super-scientist like you? 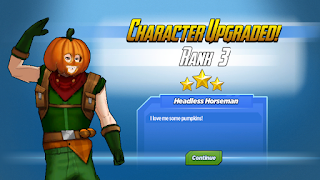 Hank Pym: What if I told you there was a world filled with nothing but pumpkins, and pumpkin-themed creatures? Jack O'Lantern: I'd say I wanna go to that world this instant! Hank Pym: What if I told you that someone already destroyed that world? Jack O'Lantern: I would be severely disappointed, and wholeheartedly disheartened. Hank Pym: What if I told you that we can stop him from destroying other worlds? Jack O'Lantern: I got lots of audacity. Green Goblin: You don't know what the word means, do you? Jack O'Lantern: That is correct. My vocabulary is severely limited. Green Goblin: So is your creativity. Your whole persona is a cheap knockoff of the Green Goblin. Cardboard Iron Man: You called me Mr. Stark, so you can have whatever you want. Why do you need to fly? 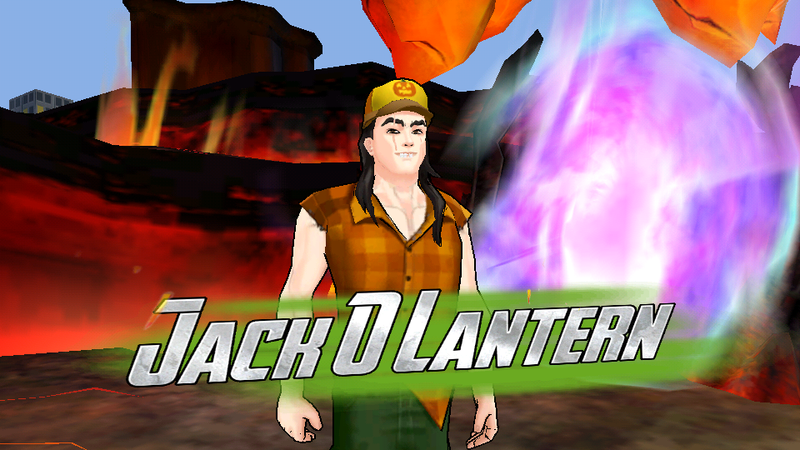 Jack O'Lantern: I must engage in airborne battle with the Green Goblin. Cardboard Iron Man: Osborn?! Oh, anything to help somebody smack that smile off his face. You want armor? A glider? A jet? Jack O'Lantern: Glider please. I like to feel the wind on my pumpkin. Nick Fury: I have a mission for you, Jack O'Lantern. Nick Fury: Stark is still making your glider. It'll be waiting for you when you get back. Jack O'Lantern: What about Green Goblin? Nick Fury: Did you find Crime-Master? Jack O'Lantern: Nah, I thought I did, but some guy called The Hood took over his operation. Nick Fury: I've heard of The Hood. Jack O'Lantern: Just to be clear here, I'm not talking about the hood on somebody's jacket. I'm talking about a guy called The Hood. A guy who does crime stuff. It's confusing because he also has a hood on his jacket. Penguin Falcon: What does it mean? Jack O'Lantern: It means I need to go full pumpkin. Jack O'Lantern: No time to talk now, Enchantress! My pumpkin people need me! Jack O'Lantern: I've heard the Great Pumpkin whispering through the fields of wheat. Hank Pym: Amazing! What did he say?! 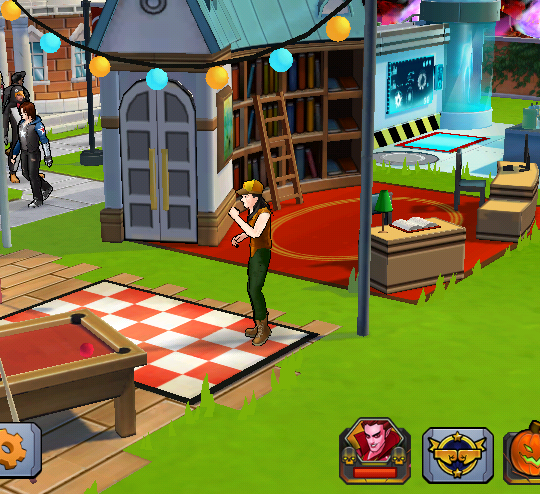 Hank Pym: Did the portal to PumpkinWorld work?! Did you meet the Great Pumpkin?! Did you get revenge for a decimated society of pumpkin-themed people and creatures?! Hank Pym: Amazing! How can I help?! Jack O'Lantern: We're gonna need a whole mess of sentient pumpkins. And we're gonna need to make 'em giant. Hank Pym: THAT'S GIANT SENTIENT PUMPKIN SCIENCE! What do you think of Jack O'Lantern? Were you able to recruit him to your Academy?